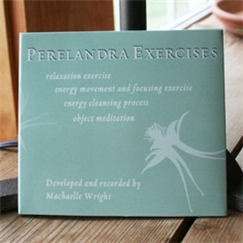 Audio: Perelandra Exercises - Perelandra Ltd. Audio tapes 1 and 2 (the 1985 recordings of exercises described in Behaving) are now available on CD, or to download. The overall quality of each recording has been improved and having them on CD (or your MP3 player) makes them that much more convenient. Relaxation Exercise (30 min. ): The Relaxation Exercise is designed to assist in relieving stress and to help you understand the focus, care and detail it takes to relax the body. Energy Movement and Focusing Exercise (30 min. ): The Energy Movement and Focusing Exercise develops the technique and discipline one needs during meditation or energy processes. It also introduces the concept of moving energy and allows you to experience this concept as a physical reality. Energy Cleansing Process (30 min. ): The Energy Cleansing Process is discussed in Behaving and the two Garden Workbooks. This 1985 recording will assist those who find it helpful to hear the steps rather than read them. Object Meditation (30 min. ): The Object Meditation exercise is referred to in Behaving and has been included on this cd for those who wish to experience the intelligent dynamic inherent in all inanimate objects.